Marshall M. Fredericks Sculpture Museum | Front view of "Sir Winston Churchill Memorial"
Front view of "Sir Winston Churchill Memorial"
This portrait head of Sir Winston Churchill (1874-1965) is four times the size of life in heroic-scale. Compared with the idealized style of most of Fredericks' works, his portrait style is more realistic though simplified. Located at the Grand Bahamas Port Authority, Freeport, Grand Bahamas Island, Churchill's serious expression and the strong modeling give this portrait a stately permanence appropriate for a memorial. A quote from Churchill is located on the memorial’s pedestal, "If we open a quarrel between the past and the present, we shall find that we have lost the future." 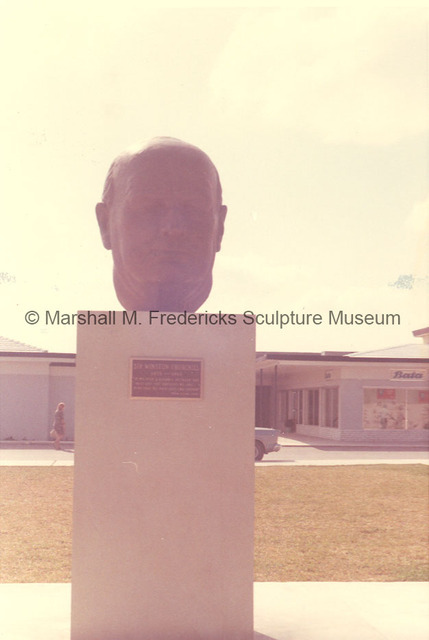 “Front view of "Sir Winston Churchill Memorial",” Marshall M. Fredericks Sculpture Museum, accessed April 22, 2019, http://omeka.svsu.edu/items/show/810.